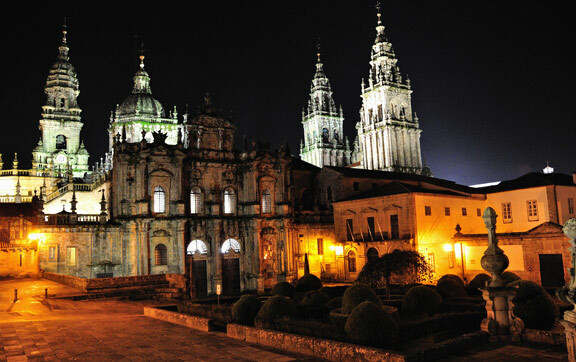 Spain’s diverse landscapes offers each city its own distinct ambience whilst the country’s long, vivid history differentiates one town from another. From the bustle of Barcelona to majestic Madrid and sunny Seville, Spain’s cities have long been among Europe’s most popular tourist attractions. Here we tour the ten, must-see historical and cultural sites of Spain which gives travellers a unique look at the country’s glorious past. 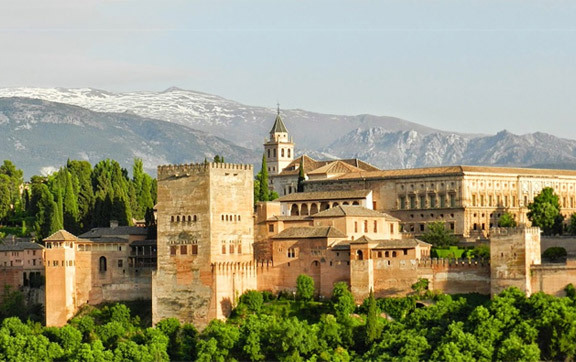 The fabled citadel and palace of the Alhambra is the Moorish legacy to Spain – and Europe. A place of exquisite ornamental architecture, trickling fountains, and lush gardens, the 14th-Century monument enchants global visitors in their droves, making it Spain’s most visited tourist attraction. Taking its name from Arabic root meaning the Red Castle, the former residence of the emirs appears silver by starlight and gold by sunlight. You cannot leave Barcelona without visiting its extraordinary architecture designed by the famous architect, Antoni Gaudi. Seven properties built by him are UNESCO World Heritage listed including: Casa Vicens, Gaudi’s first important building; Parc Gϋell, a garden complex which includes the artist’s house; and his most famous work, La Sagrada Familia. 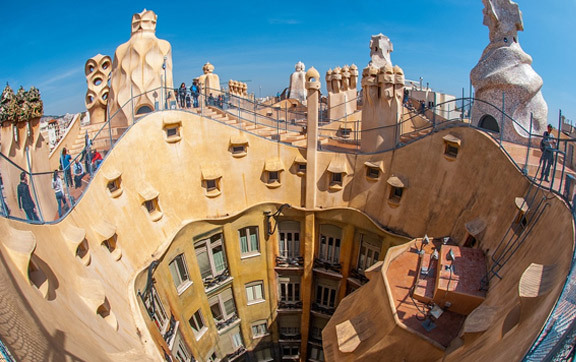 Even if you don’t know anything about architecture, when you walk the streets of Barcelona, you will probably be able to identify a Gaudi building – they are unmistakable. In the heart of Seville lies these three buildings which form a magnificent monumental complex to behold. 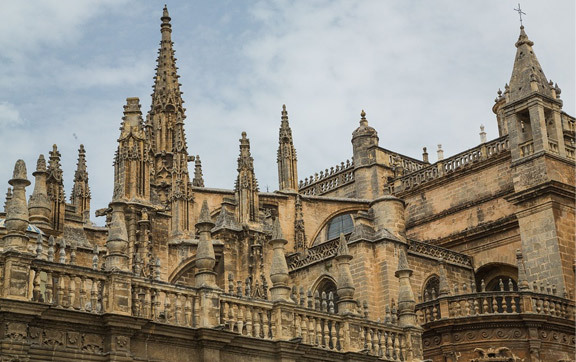 The architectural wonder of the Cathedral and Alcázar are evidence of the Almohad and Christian Andalusian civilizations during the Reconquest of 1248 to the 16th Century. The great Giralda tower is one of the most treasured masterpieces of Almohad architecture; the ancient Lonja, which became the Archivo de Indias, houses valuable documents; while in the Cathedral rests the tomb of Christopher Columbus. The historic centre of Córdoba’s conserved medieval plan of squares, promenades, ornamental lakes, and magnificent gardens, together with its unique monuments, are a reminder of the different periods in the city’s history. From Roman vestiges, Moorish minarets, Jewish synagogue, to the various Christian memorials, it is ‘an historical ensemble of extraordinary value’ situated on the banks of the Guadalquivir River. Holding Spain’s state ceremonies, official banquets, and other stately affairs, the Royal Palace is built on the site of a ninth-century Alcázar. 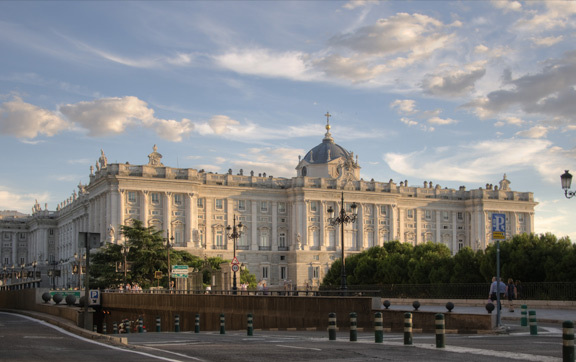 The Palacio Real is Madrid’s largest and arguably most beautiful building, and is also the largest royal palace in Western Europe. Inside, the palace harbours furniture, tapestries, paintings and ceramics, as well as important works of art and frescos by Tiépolo. The works of Velázquez, Goya, Giordano and Mengs can also be found here amongst the dozens of valuable tapestries and paintings. 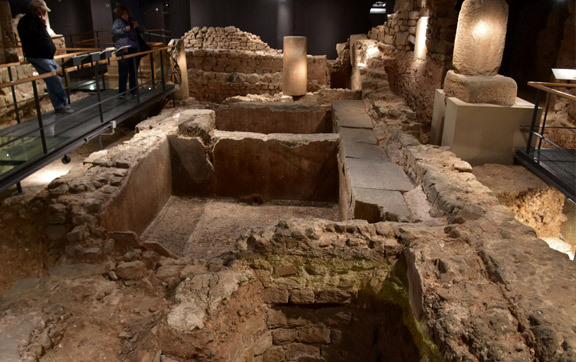 The subterranean ruins of crumbling walls, chipped stone columns and mosaic floors amidst rugged walkways and alleys make up the ancient chambers, streets, and squares within Barcelona’s City History Museum. Lying beneath the Plaҫa del Rei, it is also known as the most extensive and comprehensive underground Roman ruins in the world. They date back to the 1st and 6th centuries and were once buildings which shows aspects of everyday Roman life, including a factory that prepared fish, a wine-making facility, baths, and pits that once served as dyeing and laundering centres. Perched on a plateau in the province of Málaga, Ronda is a spectacular town with a dramatic setting. It is named aptly (Ronda means ‘surrounded’ by mountains) thanks to the Serranía de Ronda which encircles it. Established in the 9th century BC, Ronda is one of Spain’s oldest towns and was a favourite with the Romantics of the late 19th century including Ernest Hemingway and Orson Welles. 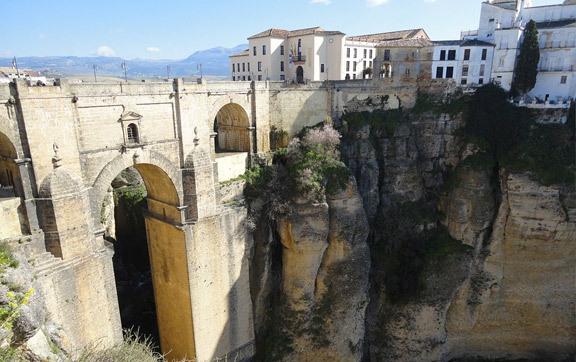 You can savour unparalleled views of the Serranía de Ronda mountains from the 18th century Puente Nuevo ‘new’ bridge, which straddles the 100m chasm of the El Tajo gorge below. With Africa on one horizon, the Mediterranean and the Atlantic on the other, and Europe at your feet, you will feel on top of the world atop the Rock of Gibraltar. The 426m journey to the top (the Upper Rock Nature Reserve) rewards you with breath-taking views of Spain’s Costa del Sol and panoramic views of quays, marinas and bays which make up the city below. 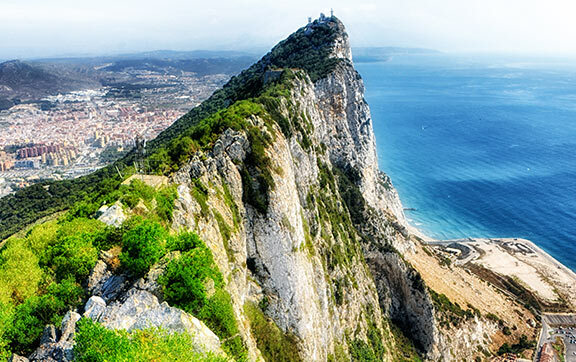 The Upper Rock Nature Reserve gives access to must-see sites, including the Moorish Castle, WWII Tunnels, the Great Siege Tunnels, Apes’ Den, St Michael’s Cave and the Mediterranean Steps. Toledo has a history of tolerance that saw Christians, Muslims and Jews live together for hundreds of years – a rarity for this part of Western Europe. 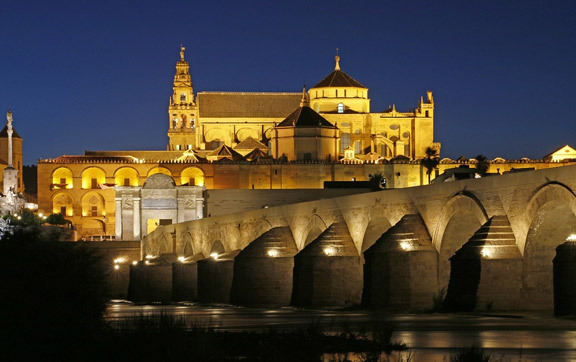 It also holds a monumental heritage of several historic civilizations which can be seen through the circus and aqueduct left by the Romans, the Visigoths remains of the city walls, the Puerta Vieja de Bisagra left by the Emirate of Córdoba, as well as Jewish monuments and 15th-16th century constructions. The looming Cathedral that marks the centre of the city was built on top of a mosque which was in turn built on top of a church. 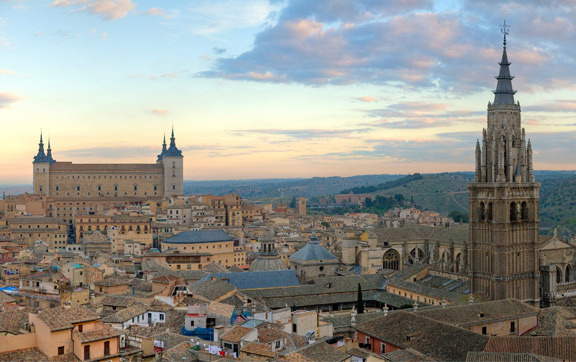 Toledo’s narrow, winding cobbled streets and ancient buildings makes it one of the most significant cities in Spanish history.